Santa Fisher info about the game-Games2Rule. Christmas Time! Santa finds a new profession, Fisher!! 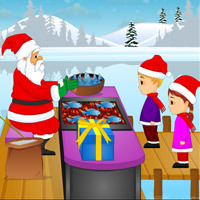 Fishing, Grilling and Selling are the vital activities have to be done in Santa's new profession. Assist Santa to be successful in his new profession. Attain the every level goal in stipulated period of time to get into higher levels.